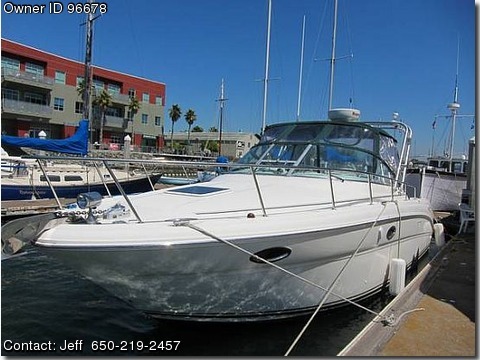 Please contact the owner directly @ 650-219-2457 or jeffk@getmewired.com.2001 SeaRay Amberjack 290 $49,900 Only 360 hours on both engines. Twin mercruiser 5.7 with V Drives. Generator, custom radar arch, rocket launchers, bait prep station, ice maker, beautiful custom teak and holly steps and flooring, plenty of storage, sleeps 6, large fish cooler, one burner stove. Features: Depth-sounder, Log speedometer, Navigation Center, Plotter, Compass, GPS Radar, TV Set, DVD Player, Radio with Ipod hookup, CD Player, Cockpit Speakers. Rigging: Steering Wheel, Electric winch. Inside Equipment: Electric Bilge Pump, Manual Bilge Pump, Battery Charger, Air Conditioning, Heating, Hot Water, Microwave oven, Electric Head, Refrigerator. Electrical Equipment: Shore Power Inlet, Generator. Engines: Hours on engines = 360. Can send more pictures of the interior.